Makenzie had another great day! She continued to push up while on her stomach. In PT today she was doing a GREAT job of isolating muscles! Exactly what we want the Neuro Suit to do for her! Thank You Jesus for leading us to Trisha and NAPA! I have postef some videos at www.dropshots.com/makenziesmiracle of her on her tummy. We got everything ready for her to start school. She will start on Tues and are going to keep meeting with and ajusting her plan and services to meet her needs. We are going to give it a go until NACD next month and then we will re evaluate were school will fit into life at that point! Well it is off to bed! I am getting pampered tomorrow and having my house cleaned! Thanks Cindy!! I can't wait to walk in with my white gloves on!! HAHA! That will last all of about 30 seconds!!! Keep praying for Makenzie! She has a lot of new stuff happening and seems to be making great progress over the last week!!! Thank You God for your faithful healing and grace!!! Makenzie had a great day today! She had PT and OT this morning. She got a good massage and then we put on the suit. we really see great things happening in the suit. The hope is that she will form new patterns and increased strength while in the suit that will carry over while out of the suit. A few weeks ago Makenzie was brining her hands up on her stomach above her shoulders and pushing herself up. She really hasn't done that again until today! She was able to do it again and not only did she push up she was able to adjust her arms and hands while pushing leaving all of her weight on one arm! I am so proud of her and feel so blessed! When Makenzie does something and then stops it makes me upset. I try to remind myself that she has done that with so many things that over time have come to stay! For instance, her smile. In the beginning she would smile and then not smile for a week and now I can't really even remember the time when she didn't smile! (I do really but well.......you know) The same thing happened with her giggle. So I guess she will get there with the pushing and rolling the same way! When she learns something new she is so proud of herself! I am so proud of her! Thank You Jesus! I talked to a lady at the feeding clinic in VA today. We will be having a teleconference evaluation for acceptance into the feeding program there in Oct. I am so excited. I am glad that we can do it here in CO and don't have to travel again! We started feeding therapy at Childrens on Tues. I hope that it will help until we can get to VA but really I am doing it for insurance reasons. I want to be prepared to tell the insurance companies that there is nothing in Co that will help Makenzie and be able to get them to cover the clinic in VA. Oh and Makenzie passed her 2nd swallow study with flying colors!!! We still can not do thin liquids because she did asperaite after 6 bited but she coughed and that is great. So we are clear for purees and nectar thick which would be like V8 juice! Yeah! We are not ready for juice yet anyways! One step at a time!!!! Tonight it took me over an hour to put Makenzie to bed.She was so happy and she laid in bed babbling and laughing! I didn't want it to end and just wanted to stay up with her all night! She also rolled like crazy! That is one of her tricks! She will refuse to roll during the day but the second you climb in bed with her she does it with such ease! She is such a stinker! Thank you all for walking with us and continuing to pray for Makenzie! As we wait faithfully on Gods healing not one of the prayers lifted up for Makenzie has gone unheard! Please keep praying! She is doing so well!! We are truley Blessed! Thank You! Sorry, Its been a while! It has been a busy week trying to get back into real life after CA! The boys start school tomorrow! It has over all been a good summer. The boys did a lot of fun stuff but are ready to go back to school and be with their friends! We had a few last summer adventures this week. We went to Boondocks on tues and did bumper boats, go carts, lazer tag, mini golf, and of course arcade games! Makenzie loved watching the boys. We have used the Neuro suit several times this week and have gotten really good at putting it on! It is alot more tricky then I though it would be. When we got home Makenzie was so loose. She really struggles with tightness in her shoulders and they were very loose at the begining of the week. Today they were however pretty tight. Both her PT's and OT feels like it was because she was handled for 3 days straight while we were in CA. She needs to get those shoulders lose and fast. It seems to be a lot of what is holding her back. Please pray that we can get details worked out to go back to CA SOON so that NAPA can help to loosen her up with the intensive therapy that she so desperatly needs! I am so upset that we did not find NAPA until after we got to FL because this clinic and its therapist are SO MUCH better then FL! Please pray for this! In the 2 days we were in CA we got more and better therapy then 3 weeKs in FL! I am bummed but excited to get there and see them help Makenzie! The biggest problem is going to be lodging. SO............... if any one out there that live near the airport in LA has any ideas let me know!!! I would like to be there before the end of the year! PRAY! There is not much more to report other then over all we are doing well. Please keep storming Heavens gates for my little princess! Thank You all for your prayers and support! I have posted some more pictures at www.dropshots.com/makenziesmiracle Check them out! For those of you that can not post on myspace or bogger my e mail is makenziesmiracle@comcast.net. Sorry I don't think I have ever posted that befor! We would love to hear from you all!!! We are back! All I have to say is WOW!!!!!!! It was a great trip! We all made it there safely on Thurs. and off to the Clinic we went on Friday morning! It was absolutly amazing! We observed the clinic in the morning and in the afternoon Makenzie got a bit of therapy. Well, really she got therapy all day because all of her therapists were there and couldn't keep their hands off of her! The owner of the Napa Institute and the creator of the Neuro Suit was GREAT to put it very mildly! We also met some very wonderful people that also walk this healing road along side us! We are are crazy I have decided! There is nothing that we will not do to help our kids! It is so nice to meet and know that there are others out there that are doing a lot of the same things we are and getting great results as well! On Sat we had an all day training on what the Neuro Suit is and how to use it! All of my therapists got in the Suit and were amazed! Makenzie did so well and was such a trooper! Of course we had to play a bit! We went to the beach and out to a great little local place on the beach for dinner! Makenzie loves the beach! We also sat by the pool and had some dinner and visited one night and back to the beach after going to Church on Sunday at the Dream Center! Thank You Lindsey for helping us find it! LA is crazy! We are of couse back to therapy tomorrow and the last week of Summer break for the boys! 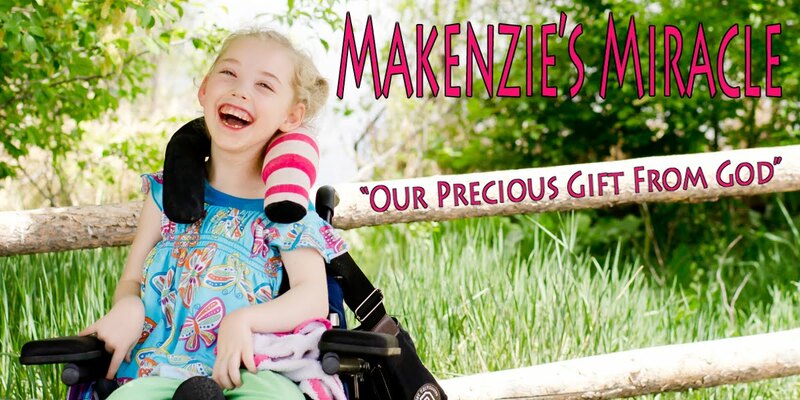 We will be heading to AZ next month to meet with the people at NACD and get a program for Makenzie! She will be starting school in a couple of weeks but I am unsure wether or not she will continue once we start the program. Doing 2-4 hours or therapy a day plus 2 hours in the suit plus up to 4 hours of NACD and school..... well you get the drift! And no, I have not forgotten that I have 3 other kids!!! Please pray for a good schedule so that our days will run smooth and pray that God gives us the support to keep up with the pace of our business! This is going to be great for Makenzie! Please also pray that when the time is right that we will be able to return to CA to complete a 3 week session at NAPA! Well that is all for tonight! I have traveled all day, unpacked, cleaned the house, and done the laundry, and now I am going to go fall into bed. I will post pictures and more details later. Sorry I rambled but my thoughts are a bit scattered right now! Just wanted to let everyone know we made it back safe and that everything was GREAT!! Keep Praying! Believe... Prayer works!!!!! Oh, what a day!!! Makenzie had a swallow study today at Children's and other then scheduling issues.....LOTS OF THEM..... what a headache...... it went great! She has been cleared completely for purees and nectar, which is close to liquid. they want to do liquid only in therapy for now but that is ok! There is no way at this point that she will eat and drink enough to get rid of the tube yet so I am in no hurry to start juice and the like! We are still waiting for the Feedng therapist to call and scheudlule so we are in a holding pattern. Makenzie has been doing a much better job with eating! She is now off of the pump for about 10 hours so that gives her lots of time to be hungry so I think that is helping. She is also still slowly gaining weight! We ran into her rehab doctor at the hospital today. She saw her last at the end of June and the first thing she said is man she is gaining some weight!! It is so obvious! She looks so healthy!!! I still am in shock that I don't have to worry about every last drip drop! Yeah God!!! Way to be Makenzie!! Makenzie has also decied that she would like to learn how to bring her hands up above her shoulders and push up with her arms!! It is so cute!!! God is so good and continues to provide!!! We are leaving tommorrw afternoon for CA!!! I am so excited!! Please pray for safe travels and that the boys will also have fun and stay safe!!! This will be the shortest trip that Kenzie and I have taken! I even got all of our stuff in 1.... yes you read that right...one... bag!!!!! Thank you all for your thoughts and prayers! Keep storming Heavens Gates for Miss Makenzie!!! Makenzie did well today in PT! It started out kinda rough though. Her left leg seems to still be bothering her. I had her PT look at it and there is nothing wrong with her joints and she didn't feel any muscle spasms. With touch to all parts of her leg she did not show any sign of pain but when you try to straighten it out she objects. She however will staighten it out herself. I ran into another PT from my church and he didn't really know either but said that she could have regained more feeling in her leg and that it either hurt or felt weird! Wouldn't that be great!!!!!! She is really starting to push with her arms! She may not be reaching yet but she sure does know that her arms and hands are there! It is coming!!!! Her sitting and head and trunk control continue to improve as well! Yeah God and Yeah Makenzie! You are such a fighter!!!! She also had a great ajustment at the chiropractor! Snap crackle pop!!!! Well that is about all for now! Please keep praying! For her leg. For our trip next week. For Makenzie's 100% restoration! Storm thoughs Gates! Believe.... Prayer Works!!!! Wow! She grew out of the GJ Button! Makenzie has had a good couple of days. She has done well in therapy and continues to gain weight! In fact a bit too much!!! She had to have her feeding button changed yeaterday because it was to small and rubbiing her and causing irratation and a bit of infection! It was along day, but we made it through!We got some antibiotics and cream and this morning it looked MUCH better! Please pray that it heals and doesn't turn into anything worse!!! I did notice today that her left leg seems to be bothering her! She does not want anything to do with having it staightened out. She will staighten it but won't let anyone do it for her. We put her in the walker tonight and she stood on one leg and wouldn't put her left leg on the ground. Please also pray for this as she is doing so well with standing and taking steps in her walker! We are leaving in a week for California! I am so excited! We are going to be able to met some great people there and hopefully form new friendships!!! I can't wait! I have heard nothing but wonderful things about this clinic and am sure I am going to be sad to leave! If it is as good as everyone says I hope to be able to do a full 3 week program there sometime in the future! We are going for 2 days of training and will be able to start our own version of suit therapy here at home! ALL of her therapist are going to be able to go, so everyone will be trained on how to work with the suit. YEAH GOD!!!! Even though sometimes it is hard to see God working in our lives He sure is moving mountians in Makenzie's life!! Please pray for safe travel and that Makenzie and I will stay well! 2 of the boys have a cold! Pray that Kenzie doesn't get it!!! Please keep storming Heavens Gates for Makenzie!!! She is doing well but has a long ways to go! The going seems kind of slow right now but I know that God is still here! He loves us and will never leave us! Thank You so much all of your prayers and support!!! "But he said to me, 'My grace is sufficient for you,' "
You have not said that your grace was once sufficient, nor that it will be sufficient at some point to come. But, you have said Your grace is sufficient for this family, now. That is a reality of this moment. It is not something we have to wish for, long for, or hope for. It is something we already have even as I pray these words. Lord, help us to always see the provision we already have from you. Forgive us for not believing in or receiving the blessings that are fully ours. No matter what our circumstances are today, show us how to walk in your abundant blessings and sufficient grace. We made it onto the charts! So I weighed Makenzie today, She is up to 26lbs!!!! I called her doctor and had him putit on the growth chart and she is at the 10th percential!!! So I really never thought I would get to say this but....... drum roll please....... we are decreasing her intake!!!! Her weight and height are perfect! I am so proud of my little princess!!! Yeah God!!! Makenzie also continues to do well in therapy both with her therapists and her mommy! We went to the outdoor mall today and played in the fountian. She loved it! Every time the water would splash her she laughed and laughed! We are all ready to go to CA in excactly 2 weeks! i can't wait to get her back in the suit and getit here for us to use tons!!! Please keep praying for Makenzie!!! Also please pray tonight for Makenzie's Paw Paw as he had major surgery! He was moved out of the ICU tonight and into a regular room and is doing very well, but has a long road to healing ahead of him! Thank You for all of your love and support!!!! Pray! Believe,,, Prayer Works!